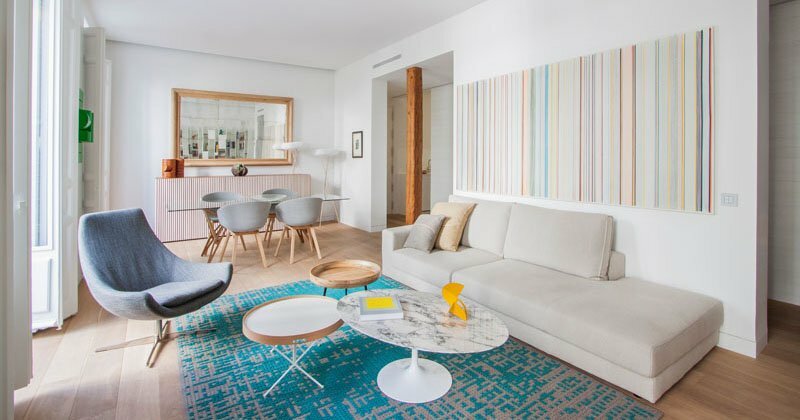 Get some inspiration from this bright apartment on how you can decorate your space. When the space of a home isn’t that big, one would make sure that the arrangement of the furniture and even the colors used in it won’t make it appear even smaller. This is the case in apartments and condominiums. There are so many space saving furniture available in the market which can be perfect for small spaces. But aside from that, we also have to make sure that the colors and design of the interior won’t make the apartment appear too small. 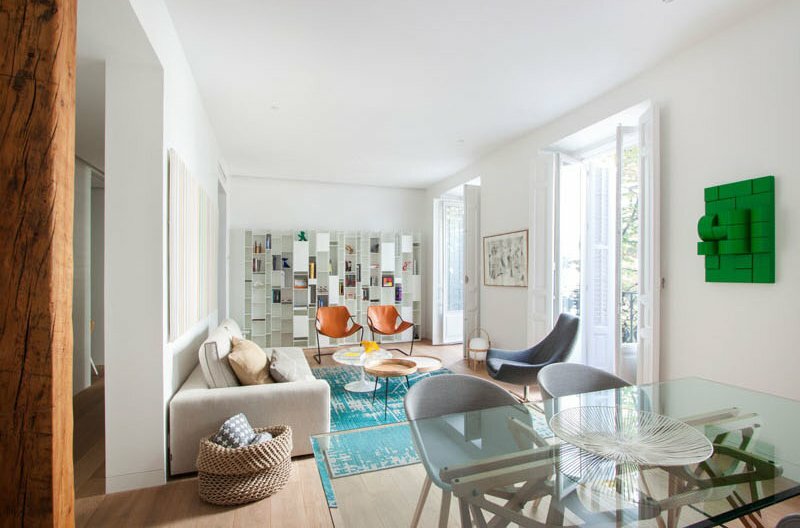 If you are looking for ideas on how to make your apartment beautiful despite the limited space you have, you can check this apartment that we will feature today. Architecture and interior design firm Lucas y Hernández-Gil worked on the project which they call CC58. 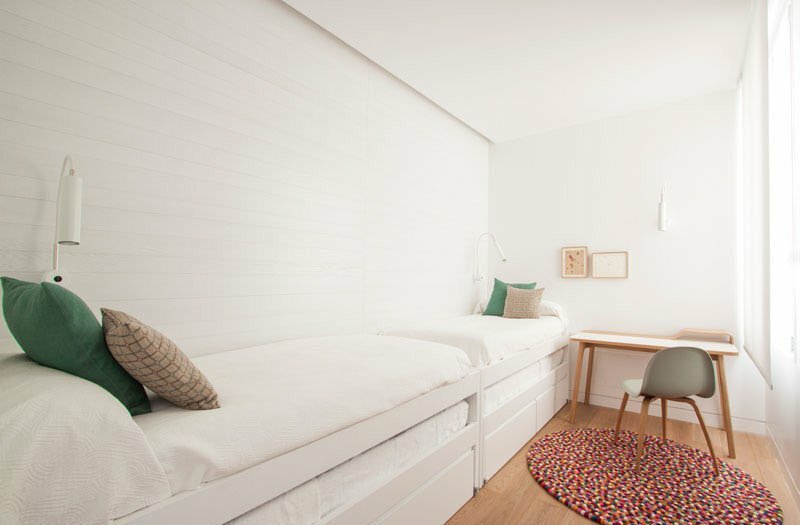 They designed a two-bedroom apartment in Madrid, Spain which utilize bright colors creating a comfortable and cozy interior. Another thing that made the apartment beautiful is the arrangement of furniture and the choice of modern furniture which contributes to the neat appeal of the home. There is also a good combination of patterns and textures in the interior which brings more beauty and depth to the space. 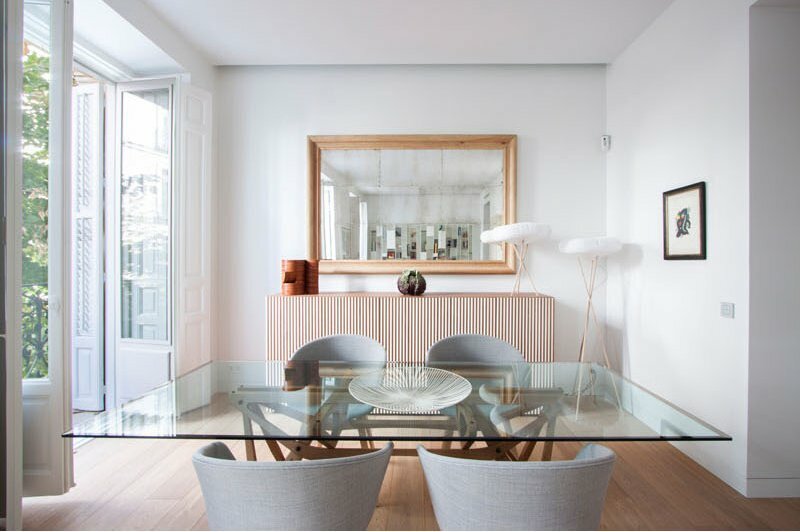 Let us take a look at this Madrid apartment below. Unique feature: A bright modern apartment interior which use bright colors, patterns and a textures. The small apartment has an open layout in the interior. You can also see that it has a long narrow balcony which allows the owners to see the outdoor area. Notice also the classic mouldngs in the door and the design of the balcony’s railings. Because of the three large windows and doors of the apartment, the interior is flooded with natural light. These can be opened to get a good view of the streets. The dining area has sleek feature in it like the glass dining table and the curvy chairs. Also seen here is a wooden console with a rectangular mirror above it. It is also nice that they added some decors on top of it. Notice that the interior of the house has many modern elements in it from the bookshelf to the wall decors. You can also see different light colors that looks really nice with the white walls. What makes it brighter is the natural light from the tall glass windows. 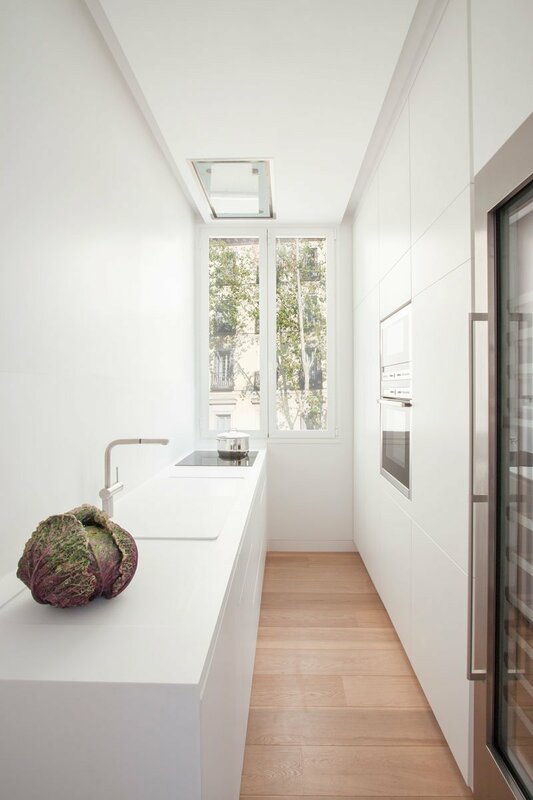 The house features a minimalist kitchen with white colors. The galley kitchen has white cabinets on one side for storage, while the opposite side of the modern kitchen has the countertop, sink and cooktop. Since the kitchen is white, light from the windows reflects throughout the space which makes it bright and airy. The master bedroom has white walls and window shades which are broken up by light wood details that are similar to the floor, accent wall and bed frame. Located opposite the windows is a wall of white cabinets. Because of its color, it almost blends in to the surrounding wall. Seen here is the second bedroom. As you can see, it is very long and narrow with two beds along the white wood slat wall. These beds have trundle beds which is intended for guests who will stay over. Also seen in the bedroom is a small desk which provides a place to study and read. This is the bathroom which features a wooden bathroom vanity with open shelving. The double sink has a tall rectangular mirrors above each one. The bathroom also has a glass shower surround that allows the light from the vertical windows to pass through and fill the room. 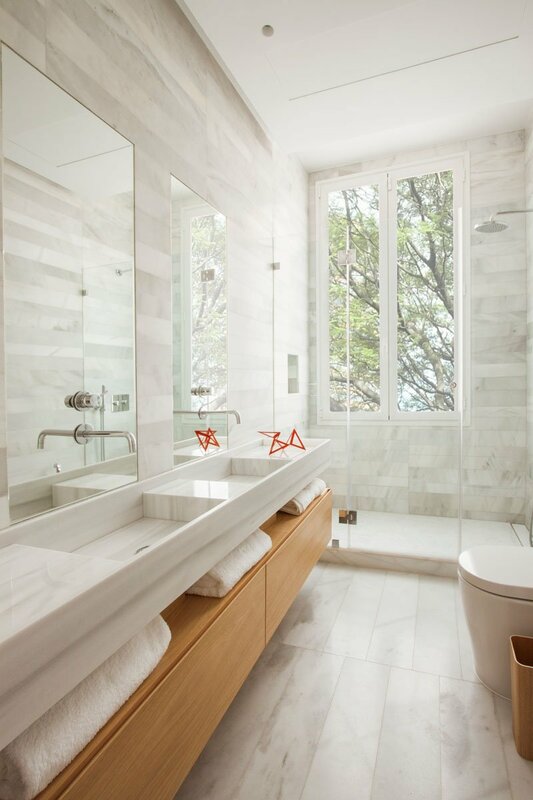 Another thing that adds appeal to the bathroom are the stone tile on it. It brings a soft natural touch to the space. For sure you will agree with me that this is a lovely apartment. Although everything looked sleek and simple, it is bright and attractive because of how it was designed. This apartment is a project by Lucas y Hernández-Gil and it turned out really stunning. The layout and design is actually ideal for modern spaces in the city. The aura is very relaxing that despite being around the busy city life, one can still find peace and relaxation in the home. 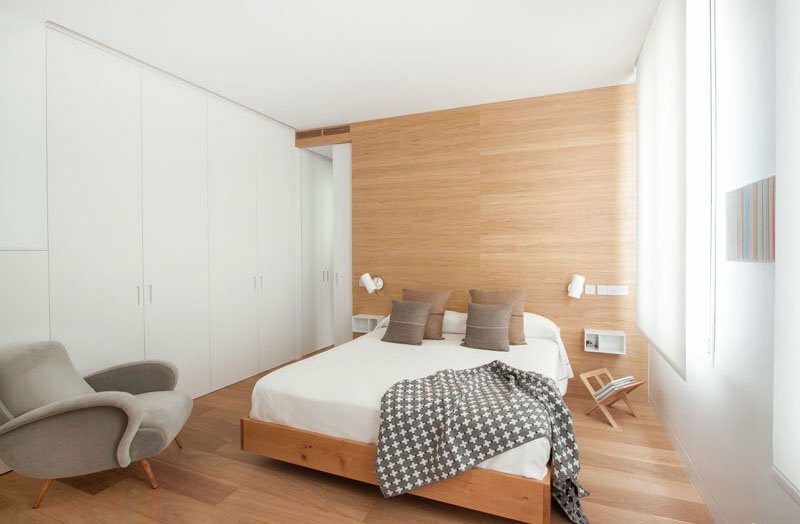 This apartment is a nice inspiration for those who live in small spaces. This also shows us that one can definitely enjoy a home no matter what is the size as long as it is decorated in the right way that fits its area. 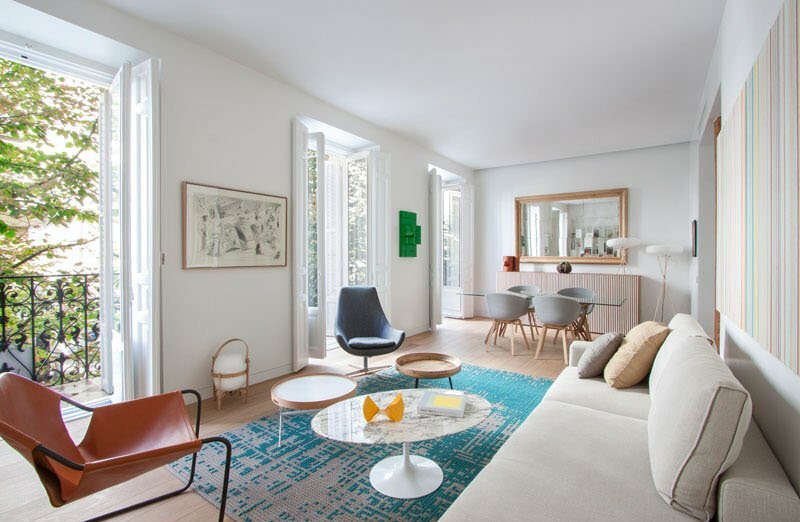 Can you tell me what you think about this apartment in Madrid?